Many people make the mistake of thinking that being charged with trespassing is a minor issue. 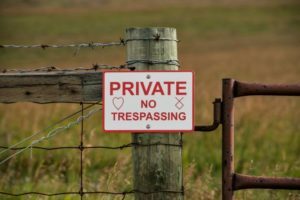 The truth is that trespassing is a misdemeanor in Arizona and a conviction can become part of your permanent criminal record. Bretton Barber is a Phoenix criminal defense lawyer who will work to gain you the most favorable outcome possible. If you have been accused of criminal trespassing then you are facing a more serious situation then you may think. Contact our attorney today. In addition to Phoenix we represent defendants in other Maricopa County cities such as Mesa, Glendale, Scottsdale, Chandler, and Gilbert. We also assist Pima County residents in Tucson. Trespassing charges are often charged in conjunction with other matters such as disorderly conduct, damage of property charges, domestic violence, or allegations of having violated a protection order. Hiring an attorney to assist you is crucial to your future. Bretton Barber is a Maricopa County criminal defense attorney aggressively protecting Phoenix residents charged with trespassing or other matters. Bretton will use your initial consultation to gain an understanding of the case. He will then acquire all relevant evidence, such as witness statements or surveillance footage, to establish possible defenses. If necessary he will file Motions with the Court to exclude eyewitness identifications and will ensure that you are adequately prepared for trial. A misdemeanor conviction can have a serious impact on your life and should be avoided if possible. Contact our lawyer today. Bretton Barber’s number one goal for every case is to have all charges dismissed. Unfortunately, that is not always possible. When a client has difficult decisions to make regarding his or her case then Bretton ensures that the client has all of the information necessary to make a decision. Throughout the legal process, Bretton will explain all of your options. These options will include whether it is best to negotiate a deal such as pleading guilty in exchange for probation and fine, taking your case to trial, as well as other solutions. Bretton values the client-attorney relationship. He strives ensure that his clients understand the legal process and the ramifications of each of their options. Contact Bretton to schedule a consultation with a Phoenix criminal lawyer.